Only a few items are effectively captured in an estimating system’s basic refinishing times, which could result in shops and staff doing a lot of work uncompensated if an estimator fails to manually add it, collision experts said last fall. 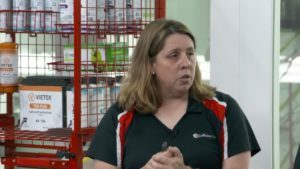 Collision Hub CEO Kristen Felder said on the October 2018 “Repair University Live” that only wash, scuff, primer/seal, basecoat and clearcoat are contained within the usual panel refinish times. Prep work to get even an OEM panel to a state where this process could begin might involve numerous other not-included operations — little 0.1s (or more) that add up for the shop and technician, according to the show. All four types of categories of panels examined by the show — new OEM (metal and plastic), aftermarket, recycled and repaired — only included the same few few items in refinish times, according to the show. This leaves many, many steps left uncounted even on a new OEM part (the basis for anything in the estimating systems), the show demonstrated. A new OEM metal part could require at least 14 not-included operations once it’s removed from the box, inspected and cleared for paint, according to the show. Removing stickers: Felder said she had seen some parts with several stickers, joking it begged the question of if the supplier wrapped the part in labels to ship it. She said she enjoyed the videos on YouTube of stickers being removed using fire, but shops attempting that kind of thing should first check the category of metal to which the labels are attached. Higher-strength steels and aluminum are heat-sensitive. Co-host Larry Montanez of P&L Consultants said he hated to see the “sloppiness” of cars still bearing the stickers from repaired parts, even if the labels aren’t necessarily a hazard. Solvent tests: Co-host Mark Olsen of Vehicle Collision Experts said parts typically come in shipping primer or e-coat. Montanez said that while aftermarket parts will have shipping primer, the factory parts tend to be more e-coated. Solvent testing matters because while paint might stick to a particular substance, it couldn’t be guaranteed that substance would stick to the substrate, Montanez said. “That’s where the problem comes in,” Montanez said, and why a paint manufacturer wouldn’t guarantee such work. Felder said one of the requirements for warranty recertification is a solvent test. Which isn’t included, Olson said. Color lookup: It’s not included, Felder said. She noted that even a shop with a color spectrum reader costing “a lot of money” might wish to recoup that investment with time on the estimate. Mix and match sprayout: Mitchell and CCC don’t include a single color mix and match and sprayout, while Audatex does within its time, according to Montanez. However, all three say it’s between 0.1-1.0 hour in variance, with an average of 0.5 hours, he said. Three variances could be 1.5 hours to nail the color, he said. He recommended painters having difficulty ask a woman in the shop to offer a second opinion. “More than likely, she’s not colorblind,” he said. 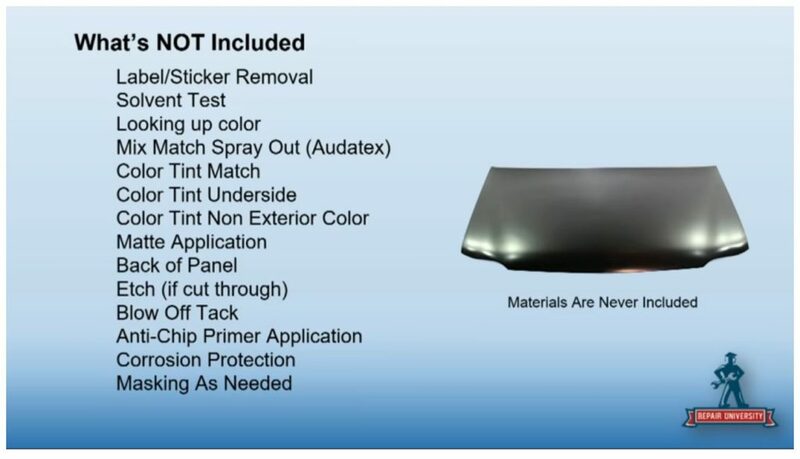 Tinting to match color, underside and interior color: Montanez said that matching interior backside colors or factory e-coat colors can be difficult, as can obtaining the correct overspray look. He also warned shops to be careful with the exterior color and contact a paint company representative if difficulties arise. Randomly adding color to make the paint “look right” instead of performing calculations will be a “nightmare” for the painter in a redo situation or for another shop down the road. Matte application: Just spraying basecoat won’t work, Montanez said. Back of panel: A new fender, for example, would still need epoxy for corrosion protection, Olson said. “Etch” primer: While scuffing is included in the refinish time, cutting through an area by mistake would require a substance like etch primer to be applied in a not-included operation, Felder said. Montanez noted that the show was using a “general term” — the paint manufacturer might want an etch primer, or they might want a wash primer or epoxy. The same might happen if a repairer sanded through body filler by mistake; they might have to reprime. He recommended having a paint manufactuer hold a one-day training course discussing such issues to prevent “very, very costly” problems after refinishing. Blow off tack: Montanez recommended that shops who did use a tack rag open it up completely, fan it, and then bunch it up to use it. While the rag couldn’t be used again in the paint department, he recommended hanging on to it for use by body technicians. Antichip primer application: Montanez said some vehicles have it on window openings, and he estimated almost every hood uses it on the first 15-20 inches. Mirrors and quarter panels might also have the substance. Masking: Masking up to 36 inches and using a car cover would be included, but anything else would be additional time, Montanez said. It’s never included for priming, however, he said. Olson said estimators have to understand the repair process. Merely taking a mint OEM hood out of the box and refinishing it before replacing it — no blending — might produce a refinishing time for the R&R, Felder said. But then “another good 12 lines” might follow it capturing all the not-included operations, she said. It’s never just a matter of clicking “replace part,” and allowing the system to calculate a time, Felder said. Which is what many shops do, Olson said. Mold repair cleanup: This refers to the mold used to form the part, Montanez said. It’s removing or shaving down leftover bits of material, he said. Felder said this must be done before painting — having the painter sent a refinished part back to the body department to remove this residue was a mistake. Montanez explained that fresh paint usually takes a couple of days before it’s fully cured, and attempting to clean up the mold residue too soon after painting could lead to the paint coming off too. He recommended doing it at the point of a technician trial fitting the part, when the residue would be visible. Adhesion promoter: Neither the labor nor material would be included, and a material calculator would miss this, Felder said. Raw bumper prep: Montanez recommended estimators build a “cheat sheet” on which bumpers come in needing it. Flex: This drew a big debate a while ago, Felder noted. It’s not included. 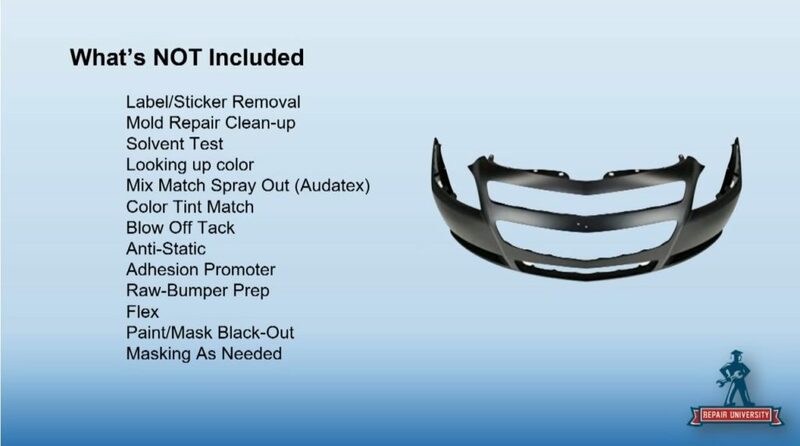 Paint/mask blackout areas: Not included, and there’s “a lot of that on bumper covers,” Felder said. Bumper covers generally add more masking, she said. Film thickness: Olson noted that it wasn’t on the show’s chart, but checking bumper cover film thickness could be important given advanced driver assistance systems. Welded OEM panels add extra steps too, and Felder said she thought that was where shops lost a lot of time and money. Adjacent panels: A welded panel adds a great deal of additional area that might need to be prepped for refinish, Felder said. Replacing a quarter panel might potentially add 22 other panels which need to be prepped, she said. If that took just 0.1 a piece, “that’s a lot of money,” she said. Anticorrosion primers: They can cost more, Felder said. Full refinish: Any panel you affected with the welding process has shifted from a blend panel to a “full refinish panel,” Felder said. “We’re not blending anything,” she said. It’s the full refinishing time, she said. Estimators needed to think of refinishing operations whenever a welded component is required. Olson said it wasn’t a situation where shops weren’t doing these steps. The work was being performed, it just wasn’t appearing on the estimate, he said. Montanez said he didn’t care if a shop charged for work or not as long as they did it, but observed that a facility couldn’t continue a “zero-sum game” very long before the company went out of business. P-pages from the three estimating services seem to bear out the show’s point that little is included. Audatex: “Two-stage is the application of a basecoat or color coat followed by the application of a clear coat as recommended by the paint manufacturer,” Audatex’s P-pages state. CCC: “Published refinish times are for one color applied to new undamaged OEM replacement components, without exterior trim, interior trim or other attached components, and applied in one continuous process,” CCC writes in the premise for its refinish times. “For damaged panel(s), published refinish times may be applied after the damaged panel has been returned to a NEW UNDAMAGED condition.